How Can I Ensure My Team's Documentation Complies with Mandated Procedures? How do I ensure documents are approved before they are published? How can I validate that stakeholders have provided their feedback on a document? Can I track when a page is approved for publishing? Is there a way to communicate to teams the status of a document in a workflow? Can we use collaborative documentation while maintaining compliance with standards like ISO, or regulations like FDA guidelines? 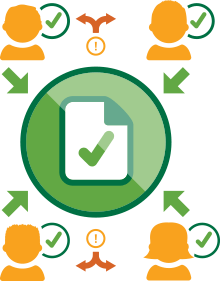 There are no easy answers to these document compliance questions, but there is a solution. Extending Atlassian's Confluence with Comalatech's apps can provide a document compliance software solution that is scalable, proven, and affordable. Confluence provides the freedom to produce documentation, while Comala Workflows adds approval and review processes to those documents. 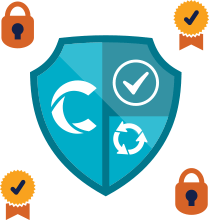 From simple management sign-offs to complex review processes requiring approval from multiple stakeholders, Comala Workflows is flexible enough to meet almost any compliance challenge. Even in situations where companies are moving from a paper-based compliance system to an electronic one, Comalatech can often translate those offline procedures into online workflows. Many document compliance specialists and experts choose this solution for their own clients, and organizations ranging from small businesses to Fortune 500 companies utilize Comala Workflows to meet their compliance needs. Want to learn more? We offer a compliance-themed webinar, click here to see our next scheduled session. Click here to read our ISO and FDA compliance statements.